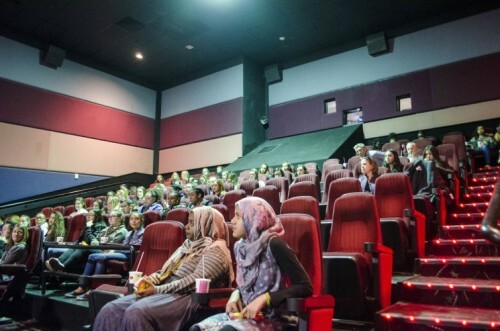 It’s not your typical backdrop for a classroom, but for students from three Denver High Schools, the movie theater at the Cherry Creek Shopping Center provided an important lesson about engineering and computer science. Students from South High School, Thomas Jefferson High School and North High School were treated last week to a private screening of the critically acclaimed movie “Hidden Figures.” The event was sponsored by the Ritchie School of Engineering and Computer Science at the University of Denver. Nominated for three Academy Awards, Hidden Figures is the untold story of three African-American mathematicians — Katherine Johnson, Dorothy Vaughn and Mary Jackson — who worked at NASA during the height of America’s Space Race with the Soviet Union. Set in northern Virginia in the early 1960s, less than a decade after the landmark Supreme Court Case Brown vs. Board of Education declared segregation unconstitutional, the three women overcame overt racism and sexism to perform the calculations that launched John Glenn into space. Following the movie, the Ritchie School organized an informal “talk back” between the high school students and three panelists — Carita Watson, Toni Dunlap and Hannah Apuan. Watson started at IBM as an administrative assistant having not earned a college degree. By the time she retired, she was the global transformation executive for IBM and had earned her degree in business from the Women’s College and her master’s degree in information systems at DU. Toni Dunlap is a Georgia native and current Ritchie School student pursuing her bachelor’s in computer engineering. Hannah Apuan is a current senior pursuing a bachelor’s in computer science and is a founding member of Women in Computer (WiC) as well as an active member of the DU Computer Science Club (DUCS). DU’s partnership with public schools in Denver and along the Front Range embodies the aspirations outlined in DU IMPACT 2025, the University’s strategic plan, which calls for engagement with the community and collaboration with local school districts. “In high school, I didn’t think I could do computer science. I didn’t think I was good enough at math. But I learned that if you work at it and persevere through it that you can actually do it,” Apuan said. “I enjoy computer science. Whenever I have to do the homework, it’s something I enjoy doing. I encourage everyone to find something they really enjoy doing and you can go far.